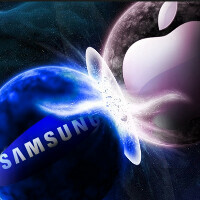 Several months ago, the first patent trial between Apple and Samsung concluded in favor of the Cupertino giant, as the federal jury found Samsung guilty of infringing on several of Apple's patents. As a result, the company from the Far East was to pay Apple some $929.8 million, but Samsung is appealing the court's decision to the Federal Circuit. This means that although the two companies are reportedly in settlement talks, the hatchet won't be buried anytime soon. One of the more recent events that will undoubtedly add some fuel to the fire is an amici curiae declaration by 27 US law professors, who revealed that they actually support Samsung in the first patent trial. They sent a letter to the Federal Circuit, which states that fining the infringer by taking away any profits, which are gained thanks to the patents in question, is typical for the 19th century, when the subjects of such trials were carpets and not modern electronic gadgets. Therefore, the awarded sum of roughly $930 million is rather high and completely unfair, the professors claim. If the Federal Circuit finds their argument relevant to the patent trial, the sum of money that Samsung has to pay could be lowered a little. “The world is more complex than it was in 1887, and so are products. The likelihood that a product has more than one patented design is much greater than it was in 1887. Virtual designs on things like icons are particularly likely to overlap, and there are more and more of them. [...] And if there is more than one patented design in a product, the syllogism that the design patent drives the sale of the product falls apart," the letter claims. Interestingly enough, three of the professors in question were apparently on Apple's side before. Professors Shubha Ghosh, Thomas Cotter, and Katherine J. Strandburg apparently supported Cupertino in its FRAND-related trial against Motorola. Just a month ago, Apple won the second patent infringement trial, which included a set of newer devices, such as the Galaxy S III. This time, Apple has to receive a trial award of $119.6 million, but Samsung is appealing this verdict in the second instance court, as well. Experts and intellectuals be damned, the law is run by emotions and gut feelings now. The law is ran by corporations who "donate" money to the right people. Well said. In short, the law is run by money. Just like everything else in America. PLZ, they're called "people" now, that means people donate to other "right" people and then get their way. If you steal in 1887, it's the same as you steal in 2014. All the law professors cannot change this simple observation. It's amazing the lengths Samsung will go rather than apologize and make amends. Samsung's hardball tactics has not work in the US because people in the US have a good sense of fairness. Mean while....Apple was guilty on a patent and the amount is probably 1/20 of the amount they got awarded in the last case...and yet they plan on appealing it...instead of apologizing and making amends. Samsung didn't steal. Apple just accused Samsung of stealing and thanks to idiots like you, Apple won in one lawsuit in their hometown. Talk about being rigged. Smartphones are the new carpets. meh. I bet the old judges own iFeaturePhones. I would think they each have a nice new iPhone 5S. Even the district iJudge is iBribed. These judges are laughing stock of justice.